March 25 saw the start of the 2016 USL soccer season. With recent expansion, the league now includes 29 clubs and is ever growing with the addition of new MLS "B" teams for Orlando (Orlando City B), Sporting KC (Swoop Park Rangers), Philadelphia Union (Bethlehem Steel FC) and Houston Dynamo (Rio Grande Valley FC), while also two new independent clubs FC Cincinnati and San Antonio. Austin Aztex did leave, but despite this, there are now more professional soccer opportunities for American players, as well as Canadians, than ever before. The ambition of these teams varies. The league has given playing opportunities to most players who I rated from NCAA Division 1 soccer on ProspectXI, as well as both domestic and foreign young players who are looking to impress and gain themselves an MLS contract in the future. USL has become a true minor/development league, although there are some more senior players in USL including 27 over the age of thirty and a number of players with MLS experience. This creates a diversity in the goals of players and the clubs they represent, as some clubs concentrate on player development while others are looking to win the USL championship. The one exception is LA Galaxy II, who have become to role model for a development team in America and currently miles ahead any other franchise. This was highlighted last season by making it to the Championship game which they lost to Rochester, and they also graduated four players to MLS, David Romney, Daniel Steres, Ariel Lassiter, and Clement Diop. Rochester, who were deserved winners last year after losing only once all season, have broughtin new ownership so although they brought back many key players it is uncertain how competitive they will be. Rochester is one of the original USL clubs and along with Richmond, Charleston and Pittsburgh, understand the league the best in terms of being competitive. While newer clubs like Sacramento, Louisville, and now joined by FC Cincinnati, on paper are the most ambitious and most likely the highest paying clubs, which should be reflected in the standings. 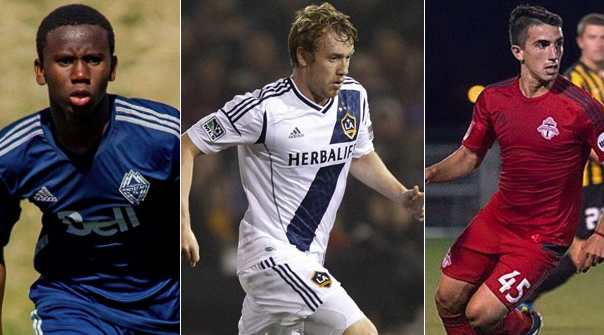 Meanwhile the MLS "B" teams vary depending on their own history in player development, ambition and recruiting. Some go out of their way to adding more experienced players in trying to put a competitive side on the pitch for supporters who attend USL games. In terms of the Canadian USL clubs, Vancouver have shown to be by far the most ambitious, and also the most proactive catering to their USL fan base. The Whitecaps II only averaged 1682 supporters per game, close to the bottom the league, although they drew more fans than both Toronto FC II and FC Montreal by three times, who were the worst supported clubs in the league. Last year, the Whitecaps signed Tyler Rosenlund, who joined fellow Canadian Senior International Caleb Clarke, but the team struggled with consistency finishing second last in the Western Conference. Rosenlund, Clarke and handful of other players are no longer with the team, instead the Whitecaps signed Giuliano Frano who played with Seattle 2 last season and a forward partnership of Canadian International Daniel Haber who returns after a number of years in Europe and USL veteran Kyle Grieg who has 21 career goals in USL. Frano, Haber and Greig join an exciting core of talented young players including Marco Bustos, Kadin Chung, Ben McKendry, Victor Blasco, Jackson Farmer, Marco Carducci and former high draft pick Christian Dean. The Whitecaps II also signed some new young Canadians in keeper Sean Melvin, defender Matthew Baldisimo and midfielder Alphonso Davies, who with Bustos and Chung played in the U20 win over England. The Whitecaps also signed Ghanaian Fatawu Safiu, who scored seven goals with Timbers 2 last season but was also yellow carded eight times. With all this promise, it is surprising that Vancouver brought in some questionable players such as Eliot Green from England and Sem De Wit from Holland, who although being young, never proved to be real talents or prospects playing in their native countries. Montreal and Toronto are both focusing on development first, and are willing to play two of the younger sides in the league. This did make things ugly at some points last season not only in attendance but also on the pitch, finishing just ahead of Wilmington for being the worst teams in the league. In the case of FC Montreal, the club’s primary goal has been to give minutes to players from their USSDA Academy side mostly from Quebec. The youngest team in the league did show some promise from individual performances of Allesandro Riggi, Fabio Morelli, Marco Dominguez, Charles Joly and Janouk Charbonneau, although in many games they were boys among men. The results of this saw the club release of 14 players prior to this season, all under the age of 23, including Fredric Lajoie-Gravelle, Zakaria Messoudi, Mitchel Bringolf and Bangala Dinkota, who I feel with more experience could play at a USL level. FC Montreal have replaced these players with another crop of players from their U-18 USSDA side, highlighted by 17 year old Ballou Tabla who is one of the more promising young players and also played for Canada U20 in the game against England along with another new FC Montreal signing Goalkeeper James Pantemis. FC Montreal still seems overpowered but are planning to use recent draft picks Kyle Fisher and Micheal Salazar as key members of the team. Hopefully their age and experience will make the team more competitive in 2016. Meanwhile, Toronto FC II are also primarily concentrating on development with a combination of players from their Academy and recent draft picks. On paper, Toronto FC seems the least active in terms of what they are trying to do with their "B" team putting little effort in recruiting players beyond the ones they already committed to. This philosophy hurt the team early last year and they were forced to sign more experienced players, although still local, in Massimo Mirabelli, Daniel Fabrizi, Emeka Ononye and Stefan Vukovic. None of these players remain, while TFC II also let go of a number of other players including Mark-Anthony Kaye, who is now at Louisville, former Homegrown player Manny Aparicio and Canada U20 players Gabriel Boakye and Marcus Godinho. The Junior Reds are hoping to replace these players by giving more significant playing time to Martin Davis and Liam Fraser, while they also signed draft picks Mitchell Taitor and Brian Jones to TFCII contracts. They will be joined by Academy standouts Luca Uccello and Raheem Edwards, last season draftees Clement Simonin, Skylar Thomas, Wesley Charpie, Sal Bernal and Alex Bono, and current first team players Jay Chapman, Jordan Hamilton, Chris Mannella, Mark Bloom and Mo Babouli, to name a few. The year of experience should help the club, although the concerns are how many players are truly committed to the TFC II cause, including management, which could lead to another difficult season. It should be said Toronto FC were one of only a few sides to graduate a player from their USL club last season into MLS, and that player being Mo Babouli who recently made his MLS debut against Sporting Kansas City. This worries me regarding the Canadian USL experience, especially with young players signing to the USL team and potentially foregoing an NCAA Scholarship opportunity. This is also true with some of the American teams, although in many cases down south teams are bringing in players once they are done school and for the most part the American teams are less likely to sign a player and then cut him soon after. Personally, I'm a fan of USL and it is the soccer league that excites me the most, as it provides a true demonstration of soccer development in United States and Canada. As shown in the recent Canada U20 victory over England, players such as Bustos, Chung, Tabla, Uccello, and Duwayne Ewart, who is currently connected to the Pittsburgh Riverhounds, are signs to me that USL will have more influence on Canada making future World Cups than any other league. I also commend the effort the three Canadian teams have put into developing a USL side, however, as I wrote when they first came into the league these clubs are about making Canadians better professional soccer players, which goes beyond just existing.